The Vista TS has multiple adjustment points to ensure a comfortable, effective fit for the majority of patient anatomies. Like the Vista Collar, Aspen Medical's Vista TS is fully adjustable, requiring only one size. Angle-adjustment mechanism on the chest provides a custom angle for each person. Height adjustment dial on the torso provides a custom length. Because the TS unit is mounted on the bottom of the Vista Collar, skin care and cervical restriction are not compromised for thoracic support. The torso height dial facilitates anatomical changes and varying positions. The Trautman Dual Bladder Vacuum Station allows for a variety of options in vacuum forming. The dual-bladder configuration enables better mold preservation during vacuum forming and improved surface quality of the molded product. The station can be used as either a dual- or single-bladder vacuum station. Requires vacuum source (two connections for dual bladder setup). Orthomerica® Products introduces the new California® Ventura™ spinal brace that is easy-to-fit yet simple for the patient to don and doff. The Ventura provides controlled levels of stability by featuring easily adjustable, rigid plastic components—making it ideal throughout rehabilitation. When spinal control of extension and flexion is desired, the Ventura is the perfect fit. The patented, compound closure system provides patient-regulated compression to supplement abdominal musculature. The Ventura is available with a tall (L-0631) or short (L-0627) rigid posterior panel. SKINGUARD® Technology silicone liners 6Y75 and 6Y85 from Otto Bock are made with an innovative antibacterial additivethat protects against a wide range of microorganisms. The high-tech material helps increase comfort and durability, improves hygiene, and reduces odor. Best of all, the benefits of SKINGUARD are now available for your transtibial and transfemoral patients who use shuttle-lock systems—and at no extra cost! To learn more, contact your Otto Bock sales representative. OPTEC's Stealth is easy to don and doff and is our most popular anterior-opening brace. The closure system provides smooth compression that can be regulated by your patients. Your patients will actively participate in their rehabilitation by adjusting compression and support to the desired level, thus enhancing comfort and compliance. Now through December 31, 2010, all of OPTEC's Stealth white braces are $75 off. This offers includes OPTEC's Stealth LSO and LSO LP L0637, Stealth X2 and X4 L0637, and Stealth Pro 2 and Pro 4 L0631. It's Still PINKTOBER at SPS! SPS will lend a pink-covered hand to raise awareness and fight breast cancer. For each SPS order of a Trulife Breast Form through the end of 2010, you will receive one FREE box (100-count) of Medline's Generation Pink Gloves. You may also purchase boxes of the Pink Gloves outright to show your support of this great cause throughout the end of the year. All sizes and shapes of the Trulife Breast Forms stocked by SPS are eligible for this promotion. All sizes and shapes of the Harmony, Symphony, SoLight, Active, Featherweight and partials are included. New: The Adjustable Dynamic Response™ (ADR™) KAFO—;No Cable Release Option. The Helix3D Hip Joint takes advantage of a groundbreaking design to create a more natural, three-dimensional hip movement. Its polycentric design improves toe clearance and provides three-dimensional movement that mimics the movement of the human pelvis, and the hydraulic provides greater stability every step of the way. The results for your patient are dramatic—greater stability and less compensatory movements to make every step more stable and confident. Contact Otto Bock HealthCare to find out more about how you can get your patients into Helix3D today. SPS announces a new workshop for medical professionals involved with the treatment of patients with neuropathic and/or dysvascular limbs. Effective management of the neuropathic limb is discussed minimally in clinical education, yet the patient population in the U.S. alone has grown to more than 18 million. The goal of multidisciplinary clinics is to reduce the associated medical costs of this chronic disease. The full-day workshop (approved for 9.75 CEUs) highlights mechanisms for clinicians to positively influence patient outcomes and prevent future breakdowns. Register online at www.spsco.com/services/educational.asp/Contact SPS customer service or your SPS sales manager for more information. The newly improved RHEO KNEE®, the latest addition to Össur's innovative bionic line, offers an increased weight limit (275 lb. ), increased torque, faster swing speed, and improved aesthetics. 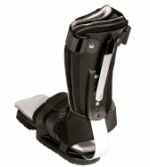 Thanks to its low build height, the RHEO KNEE is compatible with the entire Össur Flex-Foot line. Together they deliver maximum dynamics and a natural gait experience. 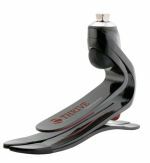 The RHEO KNEE recognizes and responds immediately to changes in speed, load, and terrain, restoring the user's ability to walk naturally, comfortably, and confidently at any speed. Javelin's design has been streamlined to focus on the essential mechanisms that govern walking—flexibility, stability, and terrain compliance—in a lightweight envelope that delivers an enjoyable walking experience. Slim line continuous shin and toe spring flexes for greater energy return and reduced back, knee, and leg muscles strain. Easy cosmetic finishing of minimalist profile. Fitting jig allows accurate limb performance and alignment assessment before final cutting and drilling. Full-length version assembled to carrier and installed in foot shell; fitting jig included for determining proper length. Low profile ships fully assembled. SPS' special freight promotion on OTS ovens has been extended. 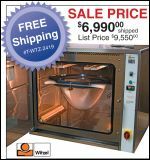 Receive $400 OFF the freight cost of ANY OTS oven purchased through December 31, 2010 (applicable to U.S. customers only). The new BT-4 oven has four, 1,000-watt heating elements on top and bottom. A standard-equipped dual electric fan kit allows low temperature operation. Another new feature is an added channel to fit vacuum hoses through the door. Exterior dimensions of the new BT-4 are 32" x 50" x 58". Interior dimensions are 28" x 40" x 24", with 18" of clearance for bubble forming. The new Alpha® Select Liner from Ohio Willow Wood combines many of the leading liner characteristics—such a controlled pistoning—into one product. The one-way stretch fabric used in Alpha Select Liners effectively controls pistoning without the use of a traditional rigid distal matrix. It also provides tissue compression without uncomfortable pressure on the limb. The fabric stretches circumferentially, allowing for easy donning for a variety of limb shapes. The Accent® foot from College Park provides a service-free option for individuals who desire a cosmetically appealing foot with an easy-to-adjust heel height. A simple push of a button provides the wearer their choice of footwear. 2 in. (51mm) user-adjustable heel height. Intended for patients up to 320 lb. or those individuals with a severe biomechanical deficit, the Model 1017-A38 Automatic Angled Lever-Lock Knee Joint is the latest addition to our comprehensive range of orthotic knee joints. Equipped with 3/8 in. x 3/4in. (9.5mm x 19.1mm) aluminum uprights, the Model 1017-A38 is modular in design and may be used in either a unilateral or double upright configuration. 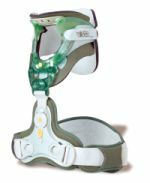 The Model 1017-A38 can be fabricated into a variety of orthotic designs including conventional metal and leather, thermoplastics, and composites. Building on the modularity of the Miami Lumbar LSO, the TLSO kit provides flexibility to fit nearly every patient while reducing inventory. Facilitates adjustments for varying levels of immobilization as the patient progresses through different levels of healing. Three steps simplify the Miami Lumbar TLSO fitting and ensure ease of use. Quick-release buckles, trimmable and adjustable shoulder straps, and added padding ensure patient comfort and compliance. Universal Miami Lumbar belt relieves pressure over the spinous processes while applying even pressure to paraspinal musculature, for comfortable and effective healing. The most popular Alpha® Liner. The Alpha Original MP Liner. Six millimeters of gel thickness, uniform style, and original green/gray fabric are the specifications for the Alpha Original MP Liner. This is the most popular Alpha Liner from Ohio Willow Wood at a new, lower price. Ohio Willow Wood is providing real solutions for practitioners and their patients. Aluminum base plate with adjustable stainless steel straps. Straps easily bend for contouring without special tools. "V" shaped straps and anchoring rivets grip casting material. Contact Prosthetic Design for additional product information. Six IR elements for even heating. Smart sensor maintains material temperature. Inside: 19" H x 24" W x 18" D.
Comfort Products introduces a more user-friendly material for the O&P industry. SpectraCarb™ nearly mimics carbon's strength, is less costly, and is easier to work with than pre-preg or woven carbon products. Laminations using SpectraCarb can be buffed without the skin irritation caused by other carbon products, and it can be modified with a heat gun without delaminating. SpectraCarb is perfect for fabricating sockets and AFOs, including major and minor adjustments, and is available in tubular form in 2-, 3-, 4-, 5-, 6-, 8-, and 10-inch widths. Spectra® + carbon = SpectraCarb = a wonder material.